3rd Edition — Oxford University Press. 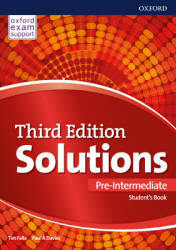 Oxford University Press’s best-selling course for teenagers is now available in a third edition, providing new and exciting content that is delivered using the successful methodology of the previous Solutions editions. 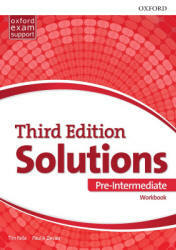 Solutions third edition offers a brand new comprehensive listening syllabus as well as word skills lessons, allowing students to master key listening sub skills, expand their vocabulary, and become confident communicators. 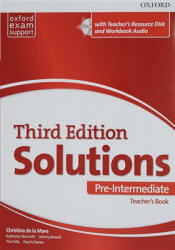 Solutions Pre-Intermediate. Course Tests Pack. 2018, 3rd. • Two short Unit Tests for every unit testing grammar and vocabulary. • Three Cumulative Tests that cover a series of units. Test 1 covers Units 1-5, Test 2 covers Units 5-9 and Test 3 covers Units 1-9. These longer tests cover grammar and vocabulary from a range of units, and exam-style listening, reading, writing and use of English tasks. • One Progress Test per unit. These longer tests cover grammar and vocabulary from the whole unit, and exam-style listening, reading, writing and use of English tasks. • One audio track for every Progress Test and one for every Cumulative Tests. • Answer keys to check progress.